Mahindra has launched the TUV300 Pus in India with prices starting at Rs 9.47 lakh (ex-showroom Mumbai). The SUV will be available in three variants, namely P4, P6 and P8. As the name suggests, the Plus is a stretched version of Mahindra's sub-4-metre SUV. 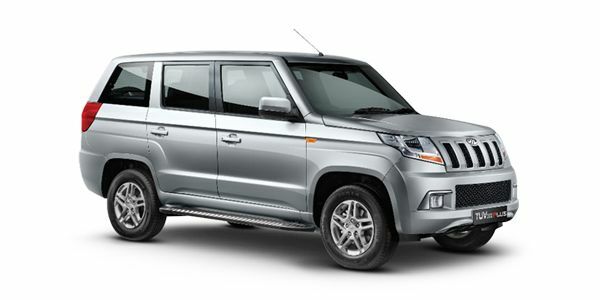 The TUV300 Plus is powered by the 2.2-litre mHawk motor that also powers the Scorpio and the XUV500. But, it has been given a rather conservative 120PS / 320Nm tune. The engine is paired with a 6-speed manual gearbox, and there's no automatic option offered just as yet. As far as features are concerned, the top-spec TUV300 Plus gets goodies such as 16-inch alloy wheels, a 7.0-inch touchscreen infotainment system paired with six speakers, faux leather upholstery and steering-mounted audio controls. That said, the biggest draw of the TUV300 Plus might just be the fact that it can seat 9 passengers. In terms of safety, Mahindra is offering dual airbags and ABS as standard across the range. The prices of TUV 300 Plus diesel variants start at Rs. 9.92 lakh and the top-end diesel is priced at Rs. 11.37 lakh. Mahindra TUV 300 Plus is available in 3 variants and 5 colours. Share your experiences with TUV 300 Plus? The claimed ARAI mileage for the Mahindra TUV 300 Plus diesel is 18 kmpl. Q. When driving this car after 100 plus speed it is vibrating, Why? Q. What the minus points of TUV 300 T4 plus? I have personally done 160kmph. But that is with eco mode off. 140 could be the top in eco mode. Q. Can the third row converted into bench seats? Q. Which model is best for a family of 10 members? As per your requirement, you may have look on ICML Extreme as it is a 10 seater car. However, you may face some issues regarding the after sale service and resale value. Q. What are the differences between the variants P4, P6 and P8? Q. Is there automatic gear system and how is the overall performance of this car? The Mahindra TUV300 Plus is an extended version of the sub-4 metre SUV. It’s 4400mm long, 1835mm wide and 1820mm tall. Compare that to the regular TUV300, and it’s 405mm longer and 3mm taller. The width and the 2680mm wheelbase remain identical. Save for the redesigned tail, the Plus looks very much like its boxy cousin. The design might not make you go wow, but it does look big and imposing. The cabin of the TUV300 Plus borrows heavily from the standard TUV300. The layout of the dash is the same, and so is the feature list. This means you get a 7.0-inch touchscreen, manual air-conditioning, and steering-mounted audio controls in the top-spec P8 variant. There are quite a few misses, including basics such as third-row AC vents and a charging socket. The big draw for the Plus is its 9-seater configuration, which is a 2+3+4 layout. Mahindra has plonked in the 2.2-litre mHawk engine that also does duty in the XUV500 and the Scorpio. However, it runs a lower state of tune at 120PS and 320Nm. The motor is paired with a 6-speed manual transmission. There’s no automatic transmission on offer. The TUV300 Plus is available in three variants - P4, P6 and P8. We’d recommend you skip the P4 variant purely because it doesn’t come equipped with ABS or dual airbags. In fact, even the P6 variant is quite bare bones as it doesn’t offer features such as a music system, a rear defogger or rear wipers. If you need a no-nonsense, abuse-friendly car, you can pick the P6, but for everything else, the P8 will seem worth the added money. None! Except for the ageing Mahindra Xylo that’s on its way out. In case you’re confused between the two, just pick the TUV300 Plus - it’s a more modern car that will be just as dependable. The TUV300 Plus fits an extremely specific need. We’re sure rural markets and cab operators will lap this up by the dozen for the extra seats alone. If you need a tough SUV to transport the whole colony in one shot, ring Mahindra! Confused about Mahindra TUV 300 Plus?